Although Jennifer was initially enrolled in Forensic Criminology, she had on ongoing interest in the technical field. She came across a college course guide where she read the description for Industrial Mechanic Millwright and found the description suited her skill set perfectly. She then made the decision to change career paths and the rest is history! In her third year of apprenticeship, one of her instructors at Conestoga College asked if she would be interested in competing at a Skills Canada Provincial Competition. Initially she hesitated, however, her instructor encouraged her by telling her he knew she could do it. The support of her company, college, family and friends gave Jennifer the additional encouragement she needed, and she agreed to compete. Winning the gold medal at the Skills Canada Ontario Provincial Competition and the silver medal at the 2012 Skills Canada National Competition earned her the respect from her peers and changed her life. The Skills Competitions gave Jennifer confidence in and knowledge about her trade as well as the courage to try new things. From this point, promoting the trades became one of her passions. Jennifer acknowledges she’s fortunate to have had several mentors throughout the years, including her teachers at Conestoga College, who helped her train for the Skills Competitions, and at her company during her apprenticeship, who taught her the tricks of the trade and provided assistance and support when she needed it. 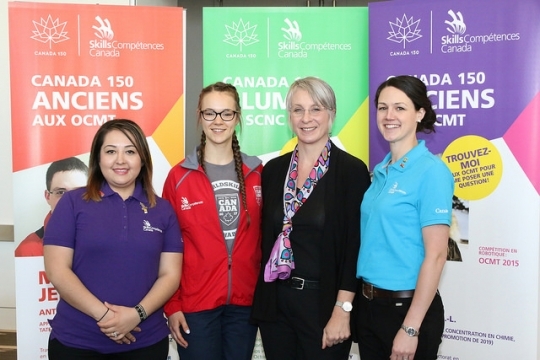 Skills Canada Ontario and Skills/Compétences Canada also had a positive impact on her career path as they provided the resources and connections that allowed her to flourish in her trade. This experience has also lead Jennifer to do volunteer work to support women in the trade and technology sectors. Jennifer has been involved with Skills Canada Ontario since 2005, giving presentations, keynote speeches and mentoring others. In 2017, she joined the 150 SCC Alumni Group and is now president of the Skills Canada Ontario Alumni Association. They’re currently working with the Skills Canada Member Organizations to start Alumni Associations across the country, and they’re working towards creating a National Alumni Committee. According to a recent survey, women account for only 4.5% of skilled trade workers in Canada (Source: The Canadian Press). Jennifer believes that in order to attract more women in the trades it’s important to introduce students to them at an early age so that they can make informed decisions. Providing information on available careers ensures that young women are aware of the options available to them before they select courses they’d like to enrol in. A few changes have been implemented to encourage women to pursue skilled trade careers. Some high schools and colleges offer all female classes for non-traditional trade courses such as Industrial Mechanical Millwright. This allows young women who may be uneasy in a male dominated class the opportunity to explore the skilled trades in a more comfortable environment. Additionally, some companies such as Linamar offer apprenticeships and scholarships to female applicants to encourage women to pursue a career in the skilled trades. Jennifer Green currently works as a Maintenance Planner/Scheduler at the Upper Grand District School Board. She was able to combine her passion for her trade with her love of planning. Jennifer’s previous experience as a Millwright has helped her in her job as she’s worked on the equipment herself and understands the possible challenges that may arise. She can also estimate realistic job timelines and create effective programs. The best advice Jennifer can offer to future generations is to follow the career path that they want and are passionate about. Be informed, discover as much as possible, talk to people who work in the profession of interest, and ask as many questions as possible. Doing the research will better enable youth to make an informed decision about their career choices.